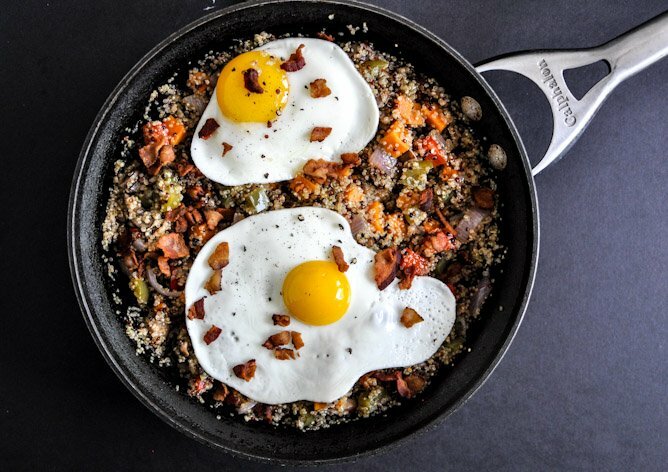 Yep, quinoa for breakfast again. Doesn’t really make you want to have a sleepover now does it? Even though I might shove quinoa down your throat in the morning, I promise the actual sleepover part will be fun. I LIVED for sleepovers when I was little. Well, sort of – I only lived for them with my best friend who lived across the street from me, because any further away from my house and I’d have a major meltdown. Not much has changed folks… not much has changed. Anyhoo – we had the best sleepovers. They usually occurred on Saturday nights right after we would watch Snick. Puhhhhlease tell me you know what Snick is. During Snick, we’d often consume an entire bag of cheddar chex mix. It was our food… sort of like our thing. And most of these sleepovers happened on the living room floor with sleeping bags and pillow fortresses and about fifty blankets. Oh, except for this one time when we decided we wanted to sleep OUTSIDE, to which we ended up sleeping in a tent… with her dad sleeping on a cot on the patio. This may come as a shock… but that’s the extent of my camping resume. If you haven’t noticed, woods and outhouses and bugs are not my thing. We also discussed 90210… a LOT of 90210. Sleepovers were the bane of my mom’s existence. Maybe it was because she had three of us to deal with, but it was more likely because sleepovers translated to “staying up as late as physically possible and acting like complete brats for the next three days due to extreme exhaustion.” There was NOTHING like staying up super late with a friend on a summer night or weekend. Or snow day! OMG… now those were the best. I’m going to embarrassingly admit that my sleepovers from 20 years ago would be eerily similar to my sleepovers today. Snick might be a Nicholas Sparks movie marathon and cheddar chex mix might be cheddar chex mix plus wine, and well… 90210 would still probably be 90210 and if anyone is up for discussing their favorite Bath and Body Works scents, I’m totally down. 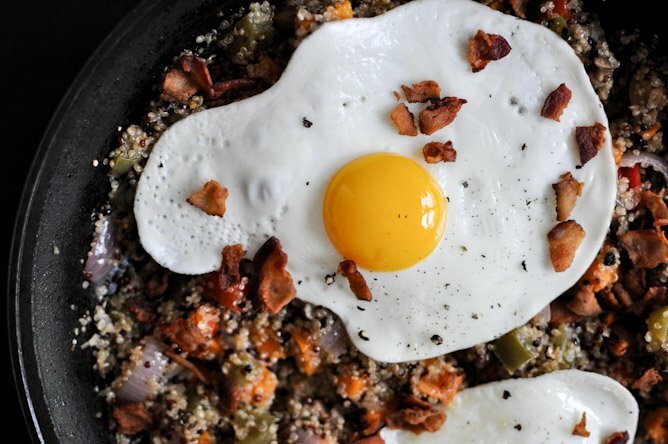 The only difference is that I’m going to serve you a trendy grain (or seed… whatever) and vegetables toasted in bacon grease because that’s the only way I can eat them and then I’m gonna top it all with a dippy egg. I don’t know. This, in fact, does sound… sort of fun. What time can you be here? Heat a large skillet over medium heat and add bacon. Cook until fat is rendered and bacon is crispy, then remove bacon with a slotted spoon and place on a paper towel to drain. 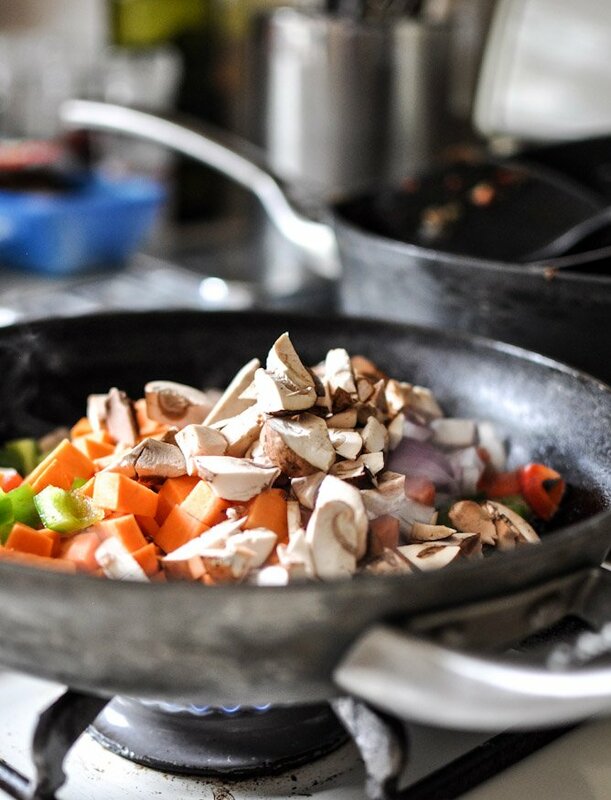 Reduce heat to medium-low and add sweet potato, onions, peppers, mushrooms and garlic to the skillet, tossing to coat. Cover and cook for 5-6 minutes, stirring once or twice, until soft. 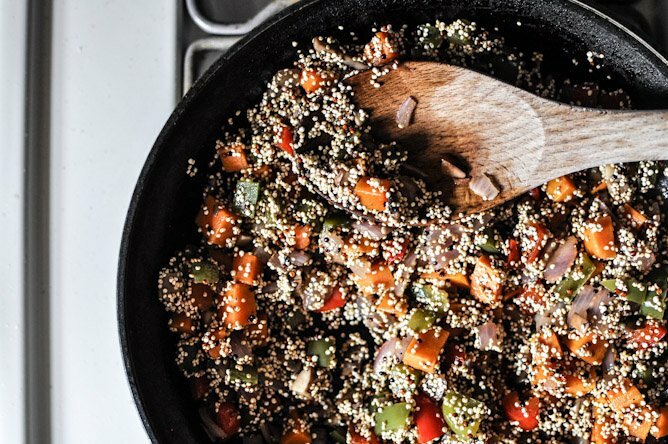 Add uncooked quinoa to vegetables and stir for 1-2 minutes, allowing it to lightly toast. Pour in stock or water and bring the mixture to a boil. Immediately reduce to a simmer, cover and cook for 15-ish minutes until quinoa is cooked through. 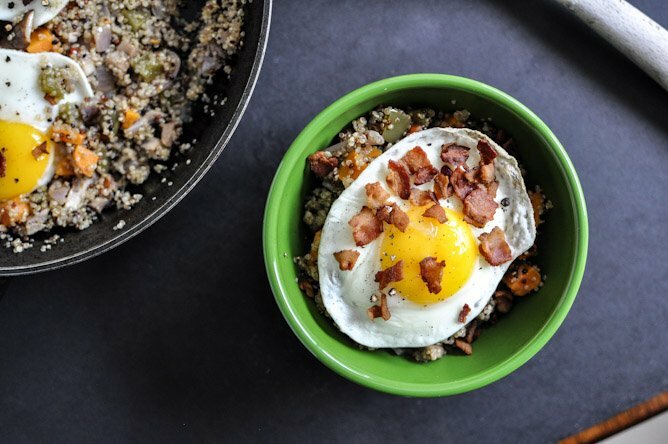 While quinoa is cooking, prepare eggs as you’d desire. Once cooked, taste and season to your liking. 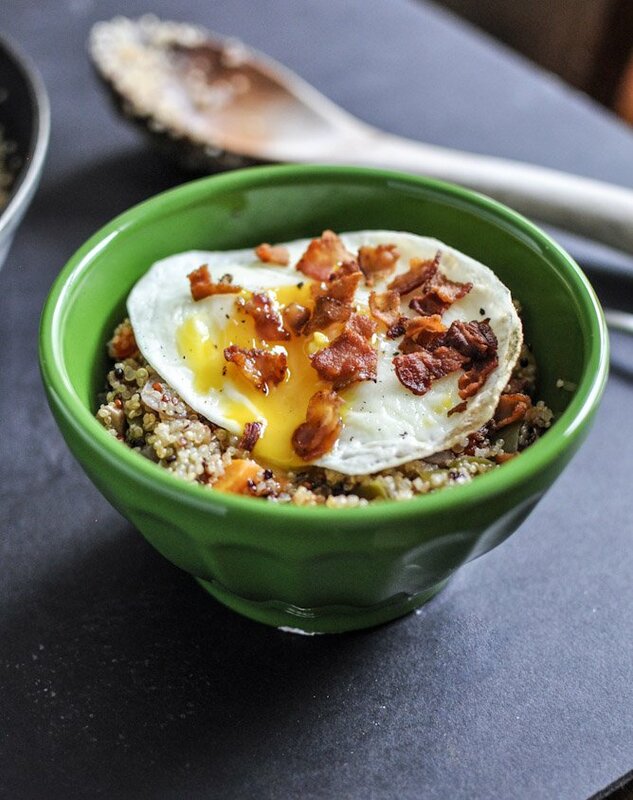 Serve quinoa in bowls topped with eggs and cooked bacon. 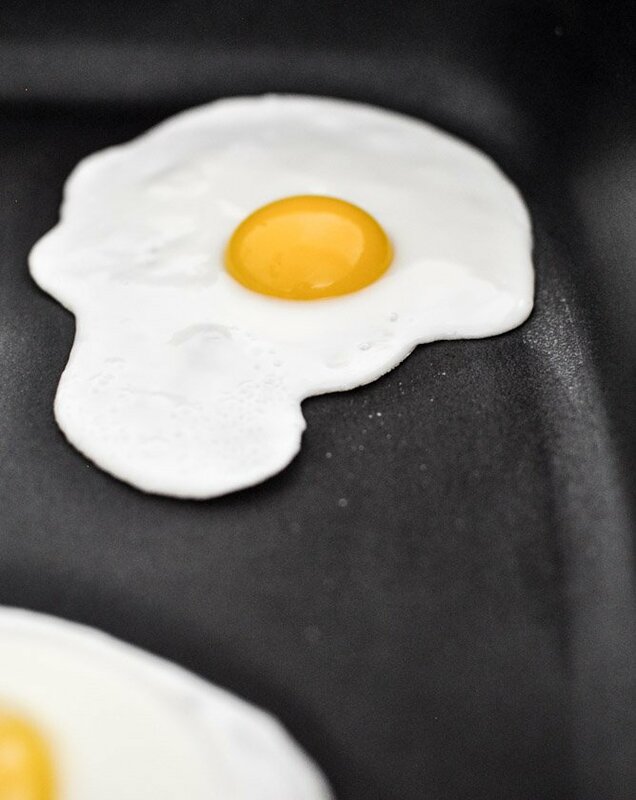 I’ll even try to cook your eggs all pretty like that. Total fluke.